Craggy peaks, winding rivers and expansive meadows animated by wildlife and wildflowers are yours to discover on this action-packed, small group adventure through Yellowstone and Grand Teton National Parks on our Grand Teton Tour. From the world’s first national park to the Rocky Mountains youngest range, explore the majesty of northwestern Wyoming with our expert guides who can’t wait to show you the hidden gems of the wild, wild west by bicycle, foot, kayak and raft. Come eye-to-eye with a 1,500-pound bull moose. Plunge into the cool waters of a secret swimming hole off of Jackson Lake. Tackle the class III and IV rapids of the Snake River. All the while, enjoy Western hospitality and regional cuisine at its finest, from cozy inns to iconic park properties. Our all-inclusive Grand Teton vacation packages are, as always, complemented by Austin’s signature touch of inspired, thoughtful service. *Special note: The July 7th departure date has been opened to teens, minimum age 13 and older. Towering mountains. Pine-studded forests. Geothermal activity. The largest concentration of megafauna in the lower 48. This six-day, custom itinerary through Yellowstone and Grand Teton National Parks has it all. By day, answer the call of the wild as you get up-close-and-personal with the great outdoors before settling into your relaxing accommodations and enjoying a massage or spa treatment. Nights capped off with scrumptious gourmet fare and fireside cocktails make our Grand Teton Vacation Packages the perfect balance of luxury and adventure. *Authorized Permittee of the National Park Service. The bison: they seem a whole lot bigger when you pedal past them on a bike under the shadow of the Teton Mountain Range! To explore Jackson Hole: where Western chic meets cowboy color. Two national parks in one trip: You're sure to see the contrast between Yellowstone and Grand Teton on this active tour covering both parks. We’ll meet in Jackson and get right to it. Take a pleasant bike ride through Grand Teton National Park getting your first views of the iconic mountain range close up. We’ll break for a picnic lunch before driving up to Yellowstone National Park through its south entrance. This afternoon we venture off onto a picturesque hike above Lake Yellowstone. Dinner tonight is in the restaurant at Grant Village. The six two-story buildings of Grant Village, named after Ulysses S. Grant, overlook the West Thumb of Yellowstone Lake and are sure to charm. The complex houses a laid back lakeside restaurant featuring a casual menu, a gift store, and a comfortable lounge perfect for relaxing after a rewarding day of travel to swap stories with fellow travelers. Located in the southernmost corner of Yellowstone, Grant Village will allow for quick access to Grand Teton National Park and you’ll cherish the peace and quiet the secluded lodgings provide. This morning we’ll begin with a stroll alongside bubbling hot springs leading to the boardwalks around Upper Geyser Basin, where we’ll of course watch an eruption of the famous Old Faithful geyser. Following lunch, we’ll trek to a neat backcountry waterfall. Shuttle to Canyon Lodge and Cabins for dinner and overnight. Fortify yourself with a breakfast at Canyon Lodge before embarking on a backcountry hike full of surprises that include spectacular views high above the Grand Canyon of Yellowstone. After lunch, drive south towards Grand Teton National Park and take in the spectacular views on the way to your accommodation for the night, Jackson Lake Lodge. This lodge overlooks the skyline of the Tetons and has a fantastic view of Mount Moran. Dinner tonight will be at The Mural Room at the Lodge. Imagine looking out your window to a wide expanse of fields surrounding a blue mountain lake, with moose, elk, and bison wandering close by. Then rising above this scene is one of the most photographed mountain ranges in the world—the Grand Teton Range. All of it so close, you feel like you can touch it. This is the thrill you can expect from the historical Jackson Lake Lodge in Grand Teton National Park. When it comes to Grand Teton National Park lodging, Jackson Lake Lodge is the largest of all the eco- friendly resorts. The lobby is where it all begins, with 60-foot panoramic windows that frame the Teton Range and Jackson Lake. The rest of the property is well worth exploring and the beauty of the area will leave you wanting to come back for more. Meet up for a hearty breakfast before heading out on a beautiful kayaking adventure via Colter Bay. Enjoy a picnic lunch with sensational mountain views in the background. Discover just how heavy a bull elk’s antler weighs at the Moose Visitor Center before whisking off on a bike ride overlooking the National Elk Refuge. The evening is yours to explore and enjoy on your own; you may want to check out the Jackson Hole Rodeo which takes place every Wednesday night throughout the summer! This luxury lodge is everything but ‘rustic.’ Located on seven lush acres adjacent to the National Elk Refuge and just a few blocks from Jackson’s lively town square, the Rustic Inn Creekside Resort & Spa welcomes guests with warm Western hospitality. Outdoor enthusiasts and hedonists alike indulge in the lavishly appointed historic lodging accommodations and luxury log cabins, state of the art resort amenities, revitalizing spa, innovative cuisine, year-round Wyoming activities and an idyllic setting. Relax in the outdoor heated pool, Jacuzzi and sauna, or take a walk along the beautifully landscaped trails beside Flat Creek. 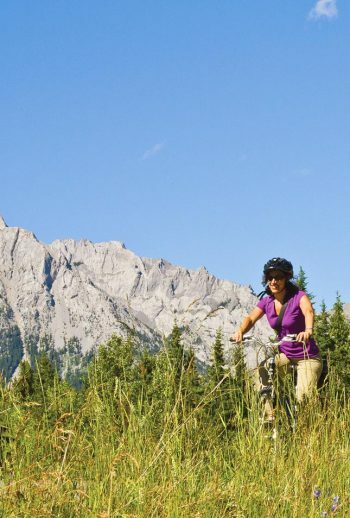 This morning, take a scenic bike ride from Teton Village to your rafting base. Picnic lunch. Get ready to get wet rafting some of Wyoming’s finest whitewater through the scenic Snake River Canyon. Tonight’s farewell dinner is at a local favorite! Please plan on arriving at least one day prior to your trip departure. Day one of your itinerary starts at 8:00 or 8:15 am, depending on your hotel. Your trip ends with a drop off at either the Jackson airport (12:00 pm) or your Jackson hotel (12:30 pm). Learn the geological differences between Yellowstone and Grand Teton National Parks. Hear both sides of the debate concerning the migration patterns of bison from Yellowstone Park. Walk the towering six story lobby of the largest log lodge in the world, the Old Faithful Inn, built under the watchful eyes of 29-year-old architect, Robert Reamer over 100 years ago! Soak up the beauty of the massive granite Teton Range and its famous Cathedral Group: Nez Perce, Middle Teton, Grand Teton, Mount Owen, and Teewinot. Take in the grandeur of North America’s largest high alpine lake, Lake Yellowstone, with a backdrop of the jagged Absaroka Mountain Range. Keep on the lookout for bears, bison, elk and wolves as you cruise through scenic Hayden Valley in Yellowstone National Park. Listen to the wind whistle through Yellowstone’s lodgepole pine forests as you witness the comeback the tall young trees have made after the wildfires of 1988. Search for the countless varieties of wildflowers in the open meadows: lupine, columbine, arrowleaf balsamroot, and Indian paintbrush are just a few of the beauties you’ll find trailside. Come discover for yourself the fun to be had in the Cowboy State with the experts in adventure travel! The hallmark of an Austin Adventures vacation is our exceptional dining. All meals: breakfasts, lunches, snacks, dinners, refreshments and receptions, except one dinner on your own, are included as indicated by itinerary. (B = Breakfast, L = Lunch, D = Dinner). Alcoholic beverages and related gratuities are not included in the trip price. All meals: breakfasts, lunches, snacks, dinners, refreshments and receptions – except one dinner on own your own. Bikes, helmets and other necessary equipment, all safe and well maintained. One dinner during your trip.